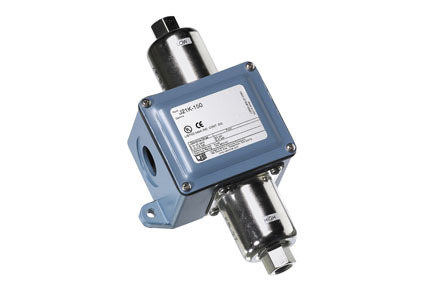 The United Electric (UE) J21K Series differential pressure switch monitors the difference between two system pressures or vacuums and senses excessive flow deviation, or verifies that a filter is clogged. The UE J21K’s rugged design – with epoxy coated enclosure and sealed metal bellows – lends itself to exacting applications. Widely used in refrigeration (chiller) and compressor applications, the J21K can be used for filter status monitoring and proof of flow.